With the change in location came a slight change of name, they are now “Karl’s Sausage Kitchen and European Market”, and walking in the door, you can see that they’ve really enhanced the “market” portion of their operation, with several rows of shelving containing a rather impressive assortment of European groceries of both common (Ritter Sport bars) and hard-to-find items. The range of goods is wide, I’ve found everything from Szeged Hungarian Paprika to Dr. Oetker baking mixes to obscure Knorr sauce mixes, zuckerhuts, Lingonberry concentrate, and Dusseldorf mustard. They do well with the sweets, too, and I’ve been able to score items like Halva Finnish Licorice and Niederegger Marzipan. But just as impressive is the line of meat cases next to the groceries: Karl’s covers an impressive array of meats and sausages, almost all of them prepared in-house, and there are usually dozens of varieties of sausage, smoked meat, and bacon available, with my particularly enjoying their bauernwurst (a chunky farmer’s sausage), their weisswurst (Bavarian veal sausage), and their triple-smoked bacon. But behind the grocery shelves, there’s a modest little cafe with about a dozen tables, and there’s where the magic is: Karl’s is now serving up prepared food and beer. 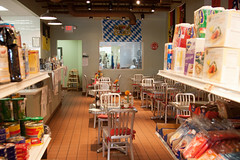 Looking over their menu, all of my favorite sausages from Karl’s are available for eat-in dining, as well as several other German items like spaetzle, schnitzel, leberkäse, sauerbraten, and rouladen. 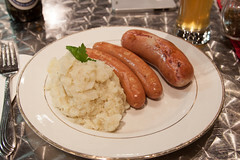 But since I adore the sausages at Karl’s, that’s what I picked for my first visit, with a sausage platter bauernwurst, wienerwurst (I was going to do weisswurst, but they were out), and a side of German potato salad. 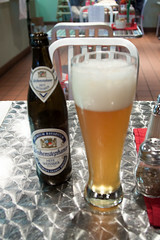 And a nice tall glass of Weihenstephaner Weissbier to wash it down. My meal? It was excellent. 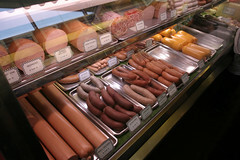 I’ve long loved their sausage, and having fresh grilled versions of it for instant gratification was quite pleasant: my bauernwurst was pleasantly juicy and spicy, with a nice chunky interior, while my wienerwurst were a nice, fine grind with a lot of mace. Both were very pleasant. The potato salad was a very generous portion, and it was a very nicely done German-style salad: primarily potatoes, with a bold vinegar and mustard note. Overall, Karl’s has done well here: they’ve moved to a much nicer and larger facility, expanded their selection, and added on-site food service, but without having to really change prices, and still maintaining the pleasant atmosphere of friendly service they’ve always had. I’m looking forward to my next visit, whether it’s for a meal or for groceries and meats to go. 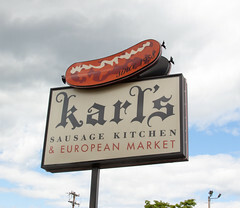 Karl’s is first rate: Will make the 60-mile trip from here (Sturbridge<MA) to there often! (Closed) While my parents were still visiting in London, my brother decided it would be pleasant to take them on a day trip, so we all hopped on a train and headed down to West Sussex to visit the town of Chichester. Like York on one of our previous visits, Chichester is pretty neat since it dates back to Roman times, still maintaining the basic Roman-era street layout and outer walls. And, like most any English city of its size, it’s now got a cathedral (Chichester Cathedral is pretty unusual in that while it has a bell tower, the bell tower is a separate building) and a Market Cross. But after a morning roaming about checking out the cathedral, gardens, and the wall of the city, we met up with everyone and had a pleasant lunch at Amelie and Friends.